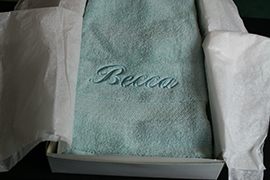 I love embroidering towels - they're my favorite monogrammed gift, and this past Christmas I really kept the machine humming with monogrammed towels for just about everyone. The challenge is that large letters have very wide satin stitches that can snag. In this video, I show you how to create Split Satin stitches to keep a nice satin appearance to your stitches while making them more serviceable. You can get the beautiful, large split satin script shown on the green monogram in the video and other fonts that work well on towels and plush materials when you buy my DVD lesson, Embroidering Terry, Fleece and Plush Materials.